A reply to www.myconfinedspace.com/2009/07/09/cuthulu-not-allowed/ . 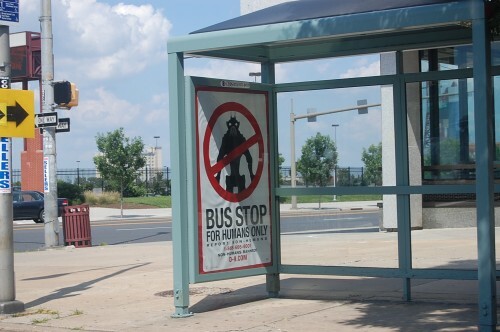 I once saw a clown at this bus stop though, do they count? This is a poster for the upcoming mockumetary film District 9, dealing with an apartheid between humans and a stranded alien race. Looks brilliant. Second as Mack said, this is for District 9, its not Cthulhu its an alien.